Breeding, causing the birth of a foal, must be a carefully considered decision, since it involves the future, and a great deal of resources and hope. The Haras de Grandcamp can offer a wealth of advice and experience in the matter. Firstly, we have a number of stallions available, with a variety of provenances and features, but always chosen with an eye for proven track record. 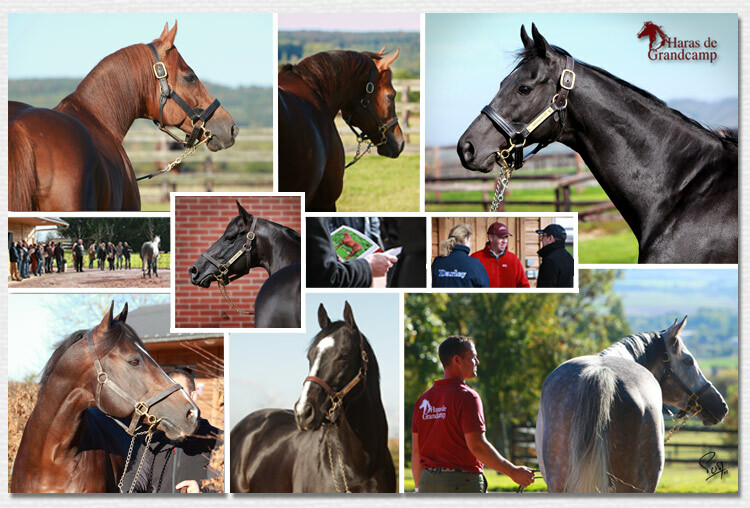 All our stallions have been group winners, some as young as 2 years of age. Others have shown a convincing record and confirmed this at 3, 4 or 5 years of age. Our stallions are all chosen with the aim of transmitting their track record and genetics to your foals. Some of the first foals are already showing their mettle, confirming the care that went into their breeding. The Haras de Grandcamp will help guide you to the right choice of stallion for your mare, according to its shape, performance and character, and in accordance with your aims- whether you wish to sell the foal as a yearling or to race it under your own colours. All of our mares' readiness for mating is assessed regularly during the breeding period. We are rigorous in ensuring good quality covers and scrupulous in our approach to hygiene with every mare. All the necessary services are provided on the farm by an experienced, efficient and available veterinary service. Mares that have foaled on the haras may remain in livery with us from the month before their due date to after confirmation of their pregnancy. With annual fertility levels regularly between 85 and 90% averaged across all our stallions, all you need to do is choose a stallion, sit back, wait and dream ! Breeding and foaling is when the potential becomes concrete. Before the foal can begin to show this potential at six or eighteen months in the sales rings, or at two years of age at the earliest on the track, a great deal of resources and attention will have been invested in this capital and in maintaining it. We can provide breeders and owners (whether they own their own premises or not) the range of services required to rear foals in optimum conditions, and with all the attention we would give to our own foals. Our motto is to deploy all the means at our disposal in the most crucial life stage of your animal to ensure the best possible chances of a return on your investment. Yearlings are exercised in order to develop the best and most athletic possible gait, most often over a two-month period. This muscle development is achieved always respecting the particular psyche of each horse, and horses are usually hand-led by a trainer. Again, this preparation stage is tailor-made for each horse; particular attention is paid by the farrier to balance, the foal is taught how to hold itself, veterinary examinations are carried out, photographs are taken and videos made to market the horse. Finally it is thoroughly groomed. 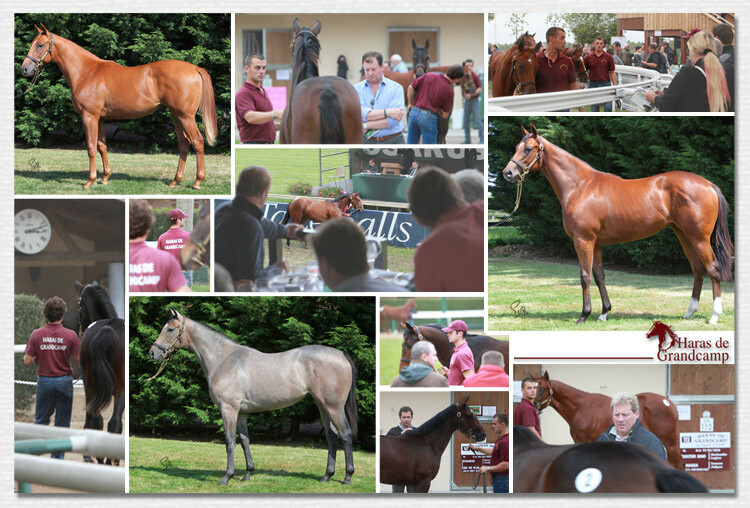 We present the yearlings to owners, investors, foreign visitors or dealers wishing to see horses on the farm as well as at sales. Finally we show your horses in the ring, utilising the trust the horse places in us to show it at its best and most fluid of movement, right until the hammer goes down. Sale are a crucial event in which nothing must be left to fate, in which every single detail counts, and everything must be done to maximise your chances at this crucial occasion. Our services are part of a cycle that includes all of a horse's life stages- we halter-train and break in foals born and reared at the Haras de Grandcamp. 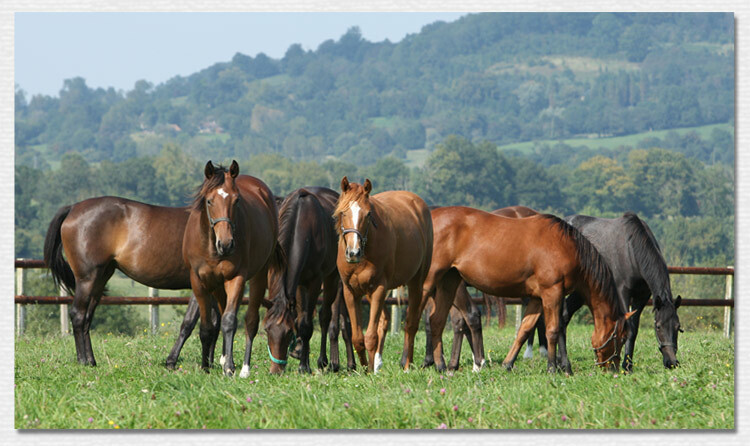 We are also able to offer breeding solutions for both stallions and mares at the end of their competitive careers. Dabirsim, now a full-time stallion on our farm, was as a yearling prepared and sold by us at Deauville for his owner, and is a perfect example of this cycle. Horses bred and prepared by us at the Haras de Grandcamp have begun to show success for the last few years, enabling us to become a leader in the various sales rings, sometimes even achieving top price. We are known for the seriousness of our work and our unstinting devotion to preparation. Our results speak for themselves. The high profile of the Haras de Grandcamp represents added value that you can gain from by entrusting the future of your foals to us.